The reigning queen of daytime TV might be calling it quits. 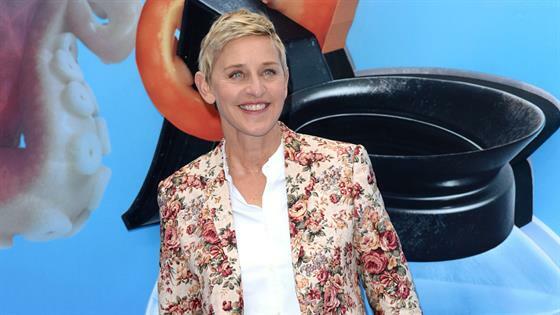 Ellen DeGeneres opened up about her future and that of her hit daytime talk show, the appropriately titled The Ellen DeGeneres Show, in an interview with The New York Times and revealed she's thought about calling it quits. DeGeneres said her wife, Portia De Rossi, is in favor of her saying goodbye to the long-running chat fest, but her brother believes she should stay put as a beacon of positivity. "She gets mad when my brother tells me I can't stop," DeGeneres said of de Rossi. De Rossi, a veteran of such shows as Scandal, Arrested Development and Ally McBeal, added, "I just think she's such a brilliant actress and standup that it doesn't have to be this talk show for her creativity. There are other things she could tackle." If she does leave, DeGeneres expressed interest in doing another movie and playing somebody "unappealing." De Rossi said, "I don't see the end of her show as her career ending." DeGeneres filmed her first standup special in 15 years for Netflix. Ellen DeGeneres: Relatable is set to debut on Tuesday, Dec. 18 and feature the talk show host tackling her mega fame, among other topics. The comic and host wouldn't be the first wildly popular host to say goodbye to their host. Here's what happened to those that did. O'Donnell, another standup comic-turned-host, helmed her own series for six seasons. The Rosie O'Donnell show aired from 1996-2002 and won multiple Emmys during its run. O'Donnell decided to leave the daytime space—for a time—to be with her children. O'Donnell returned to daytime TV in 2006 as the moderator of The View, replacing Meredith Vieira. Her View tenure wasn't long—she made her debut in September 2006 and exited in April 2007. O'Donnell hosted Rosie Radio on Sirius XM from 2009-2011 and returned to TV with The Rosie Show on Oprah Winfrey's OWN Network. She returned to The View for season 18 in 2014, but left in 2015. In between the end of her daytime talk show and first The View stint, O'Donnell appeared in a handful of TV shows, including Queer As Folk and the TV movie Riding the Bus With My Sister. She returned to her standup comedy routes in 2015 with an HBO special and has been acting consistently in the later aughts, with roles on Smash, When We Rise and Mom. O'Donnell can currently be seen in Showtime's SMILF. For 25 seasons, Winfrey hosted The Oprah Winfrey Show. Have you heard of it? Winfrey produced more than 4,500 episodes of television between 1986-2011. Before signing off her show, Winfrey was already working on her next chapter: her own network. Discovery and Winfrey teamed up for OWN: Oprah Winfrey Network first announced in 2008. The channel eventually launched in 2011 and it's there she continued showcasing her knack for talking to folks with Oprah's Master Class, Oprah's Lifeclass, Super Soul Sunday, Oprah: Where Are They Now?, and Oprah Prime. Winfrey has kept busy acting since wrapping her series, appearing in The Butler, Selma, Greenleaf, The Immoral Life of Henrietta Lacks and A Wrinkle in Time. She recently appeared in a voice role in The Handmaid's Tale. Her magazine, O, The Oprah Magazine, is still going 18 years after launch. Winfrey joined 60 Minutes as a special contributor in 2017, but took a leave of absence to campaign during the 2018 midterm elections. Sally, or The Sally Jessy Raphael Show, entertained audiences for 19 seasons from 1983-2002. The show was generally more tabloidesque and featured a wide range of topics. After the end of the show, Raphael hosted a daily radio show on Talknet until 2008. Since, she continues to make appearances across the pop culture spectrum, including on the Rachael Ray Show and Cultureshock. For 11 seasons between 1993-2004, actress Lake had her own talk show. Ricki Lake, sometimes just called Ricki, was different from daytime shows helmed by DeGeneres, O'Donnell and Winfrey. Ricki was leaned into sensationalism and tabloid fodder more so than others, with topics aimed at young adults. The show featured celebrity guests at times, but also tackled everything from romantic relationships and LGBTQ issues to substance abuse and homelessness. Lake ended the series to spend more time with her family. Lake, who was famous for her work in Hairspray, continued to act after her series ended. In 2008, she executive produced and was also featured in The Business of Being Born, a documentary about childbirth. Ahead of her talk show debut, Lake was a competitor on Dancing With the Stars and took third place. In 2012, The Ricki Lake Show debuted, focusing more on topics of a personal nature. only lasted one season producing 186 episodes. The Jenny Jones Show ran for 12 seasons from 1991-2003, producing 1,500 episodes along the way. The talk show, hosted by Jones started out tackling more serious subjects before transitioning to topics viewers were likely to see on Maury and The Jerry Springer Show (paternity tests, teens gone wild). After the end of her series, Jones went on to host her own food series, Jenny Can Cook. While it seems many past talk show hosts didn't stray from the format afterward, DeGeneres had an extensive acting (two sitcoms) and comedy career before becoming a daytime TV host. As de Rossi said, her career won't end when she calls it quits. The Ellen DeGeneres Show airs weekdays.